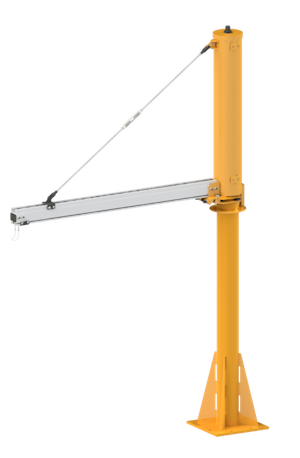 Knight’s MJBA2100 & MJBA2200 Turnbuckle Jib Cranes are ergonomically designed to accommodate workstations where ceiling heights are inconvenient for an overhead crane system. This series offers a large tool coverage area with a single rotating rail on a floor-mounted pedestal. It also has a level adjustment screw used to adjust the pitch of the rail and an adjustable hard stop. Knight Jib Cranes have Timken® Tapered Roller bearings that provide a smooth 360 degree rotation and have boom lengths available up to 20 ft. [6.1m]. For low headroom clearance applications. Level Adjustment End Bracket used to adjust pitch of rail. Max. 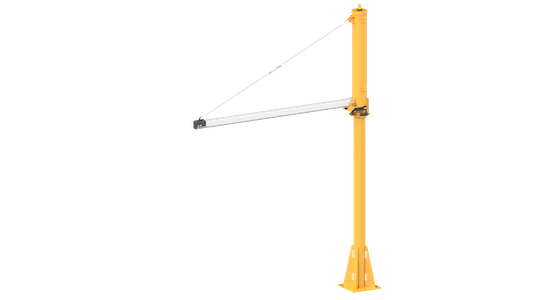 Jib Length: Up to 20 ft. [6.1m]. Max. Under Rail Clearance Height: Up to 15 ft. [4.5m]. Max. Capacity: Up to 140 lbs. [63.5kg]. McGill® Cam Yoke Roller Bearing. Max. Capacity: Up to 745 lbs. [337kg]. NOTE: Capacities over 500 lbs (227 kg) require Dual Load Trolleys.